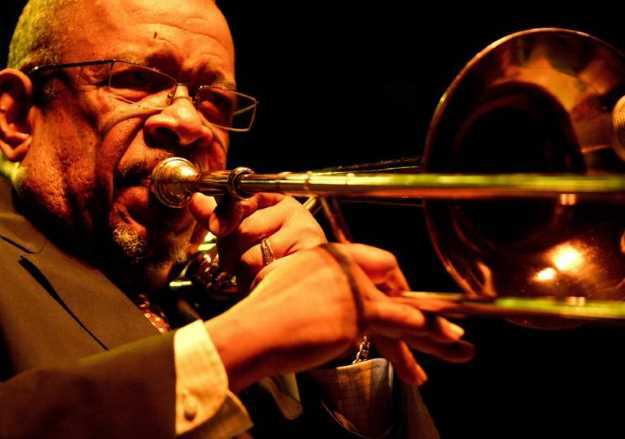 Life isn’t fair and the best don’t always get famous, and no matter how many times I tell you Fred Wesley is a legend, if you haven’t heard of him, you won’t buy it. The crowd at Ronnie Scotts did know, though, and those who didn’t soon pretended so they didn’t look out of place. One time sideman of James Brown, Maceo Parker’s longstanding foil and the leader of Parliament Funkadelic’s Horny Horns, Wesley is, as tenor sax Phillip Whack bellowed to the crowd, “a funk God”. It was a role he underplayed, keeping things simple, playing to the space – a habit honed, no doubt, through years of sessions with everyone from Ray Charles to the Red Hot Chili Peppers. “Feel free to dance”, he smiled, walking on the strains to bassist Dwayne Dolphin taking a deep dive into Herbie Hancock’s Chameleon. For a moment, it looked like the crowd wouldn’t; it was a room full of polite types academically nodding along as the six piece – no trumpet tonight – went harder and harder into each groove, lips curling and chins shaking, feet shuffling and shoulders rocking. They were sharper than the records, the beats clicking and popping with impossible tightness. Welsey stayed cool, looking a little like late-stage BB King, smiling serenely as his band did the work. There were stories every now and then; his charm won through. Then, slowly, the cocktails seemed to spill into everyone’s system and the famous Ronnie Scott’s red lamps began to rock and wobble as knees shuddered and hips shimmied. Four Play – complete with a story about George Clinton – didn’t do much, but the elastic funk of Peace Power made its mark. Stabs at the blues were quickly coughed away, but when they screwed the funk tighter and tighter, the band had the room moving to every snapped snare and frenetic guitar line. The outrageous virtuosity of Peter Madsen on keys added a few clattering chords of welcome dissonance, emphasising rather than undermining each groove, while the ever smiling Bruce Cox battered a drum set which can't ever have come within 64 bars of beats on one and three. Breakin’ Bread became Pass the Peas and Wesley let go, unleashing some of his signature bright, honking tone, a nice contrast to those other moments where was strangely muted. Just now and then, he seemed either unsure of his venue or sure of his age. It was time for House Party, and the room rose, hundreds of awkward dancers suddenly forgetting to care and hollering along as the horns pushed and pushed and guitarist Reginald Wald clicked through his licks. Just then, within sight of the finishing line, Wesley’s brass had all the power it did when James Brown danced to it.